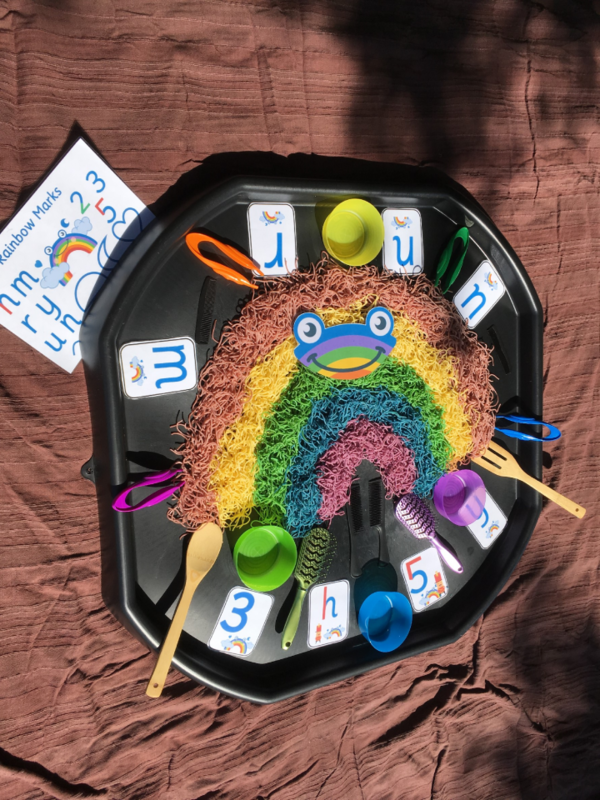 I am often asked in my Little Learners classes how I make my playdough and other tray contents, so I thought I would share my top 5 activities that are easy to make and fun to play with at home. 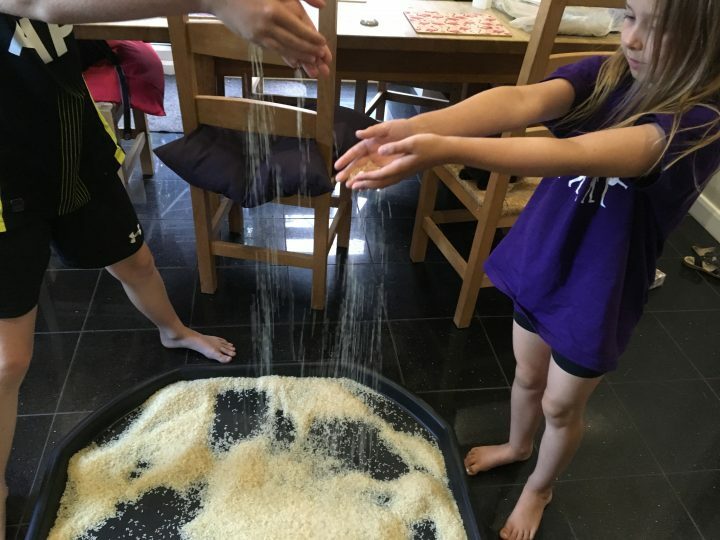 I have included some less messy activities for those of you that are a little apprehensive about embracing messy play at home! However, most are really easy to clear up. You can use a large tuff tray (like the ones in class) if you have one. Or just as easily a water/sand tray, a washing up bowl or even just in the bath! Tuff trays can be purchased from many places. Here’s a link to Amazon…. the different coloured ones are great but a little more expensive. Also light coloured trays do stain more easily. 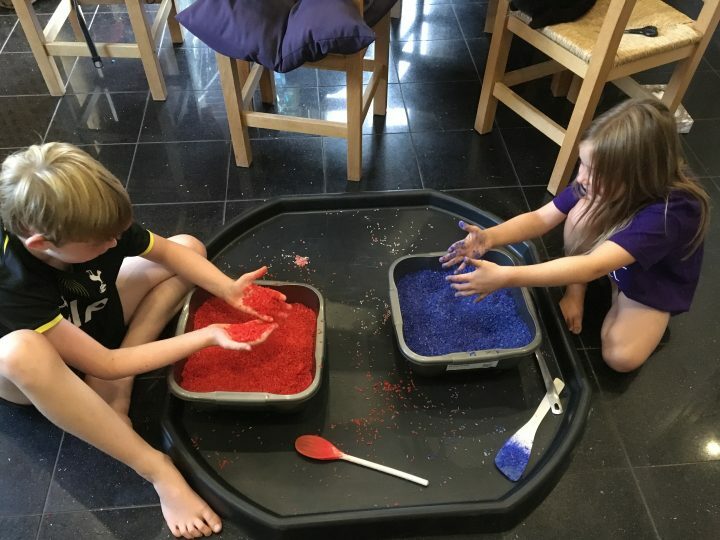 https://www.amazon.co.uk/tuff-tray/s?page=1&rh=i%3Aaps%2Ck%3Atuff%20tray You can even get inserts to put into the tray for imaginative play. Or this is just a garden planting tray available in garden centres and online. TOP TIP! If you put an old sheet/towel under the tray, it catches a lot of the mess and then you can just chuck it in the washing machine. 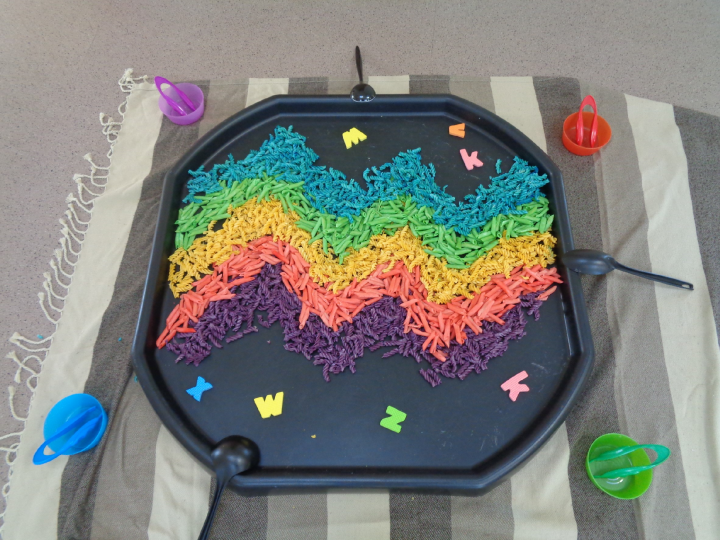 This has got to be the top play resource that you can use at home. 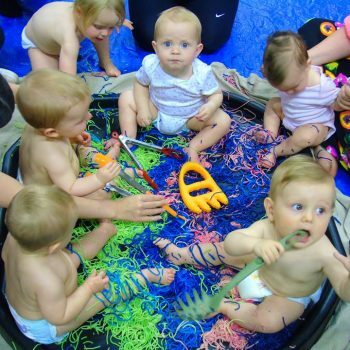 It is fantastic for developing children’s fine motor skills and building up the muscles in their hands and fingers. These will both be needed when they begin to manipulate tools, including pens and pencils. There are so many tools you can buy to play with too. 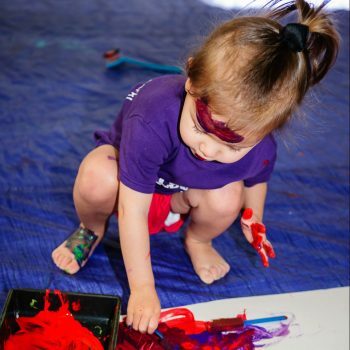 The possibilities for imaginative play are endless! 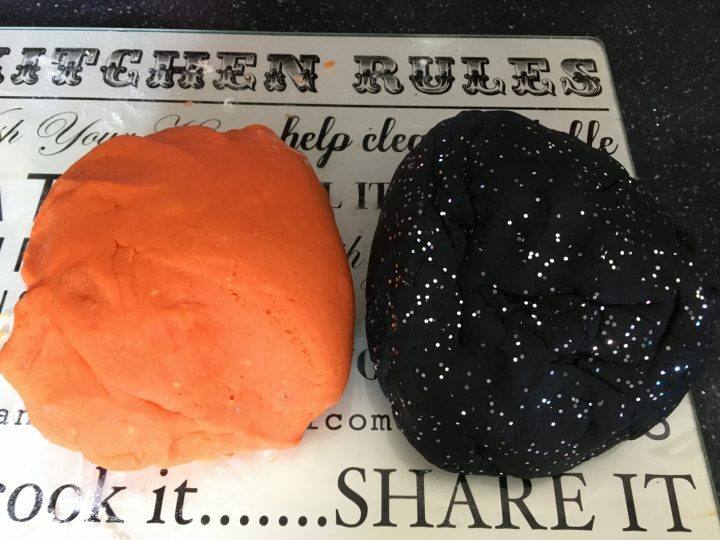 This is my Halloween playdough – love the sparkles! You will need: 1 cup plain flour, 1 tbsp oil, 1 cup water, half cup of salt, 2 tbsp cream of tartare (available in supermarkets in the baking isle), food colouring. Method: 1.Put all the dry ingredients (flour, salt, cream of tartare) in a microwavable bowl. 2. Add the water, oil and food colouring (I find gel food colourings work the best). 3. Mix together to get rid of lumps (I use a hand held food mixer to make it really smooth). 4. Place in the microwave for 2 minutes on high. Then remove and stir. 5. Repeat this process until the playdough is the correct consistency, removing and stirring after each zap. 6. 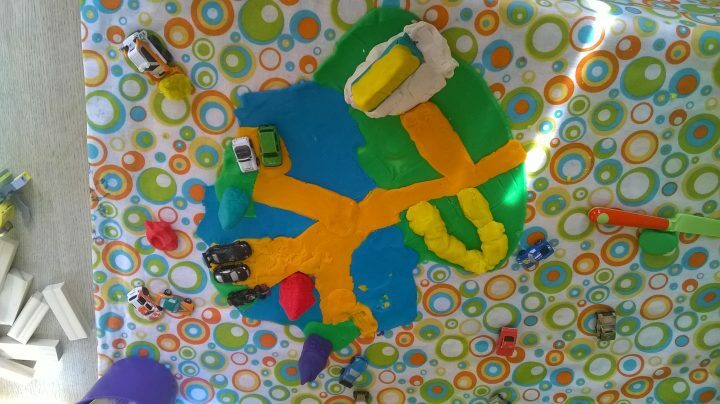 Tip out playdough onto a floured chopping board/worktop. 7.Mould/knead the dough until it is smooth. You may need to add extra flour at this stage if your dough is a little sticky. 8. Add any other materials such as glitter, sequins, herbs, essential oils etc… 9. PLAY! Store your playdough in an air tight container. Top Tip!! 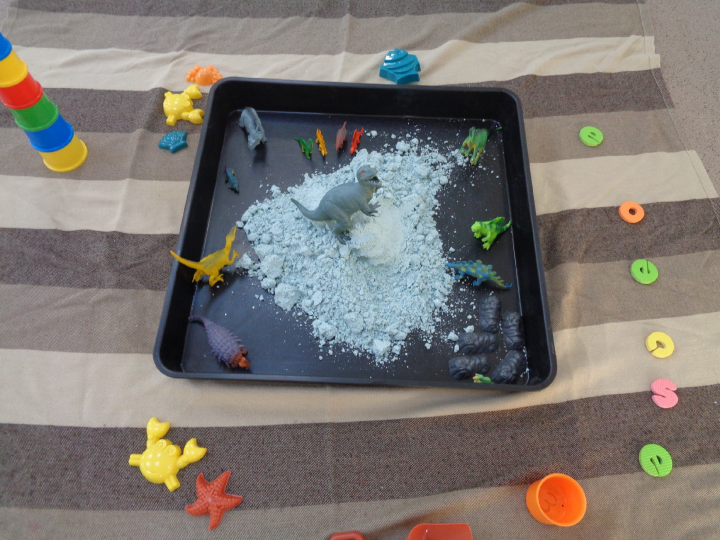 I add a sprinkle of baby powder to my playdough to make it smell lovely and feel supersoft. 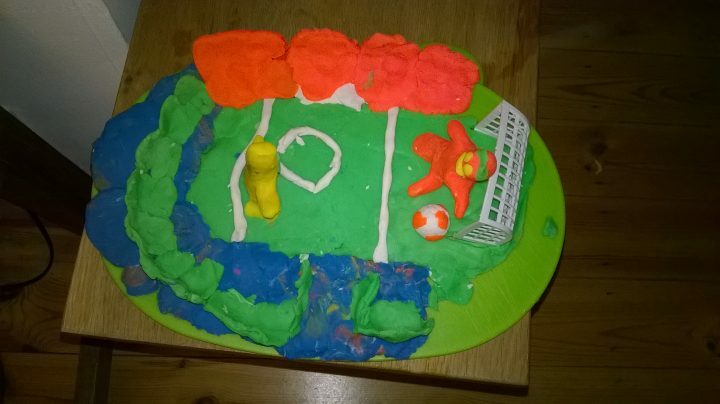 My children (now 10 and 8) would play for hours making road tracks, villages, football pitches and cakes! This is my new found favourite substance to play with and I often use it in classes. It has the same feel to it as sand, so can be sculpted and moulded, however is a little more crumbly. It can either be used in it’s natural state or you can colour it by adding powder paint. 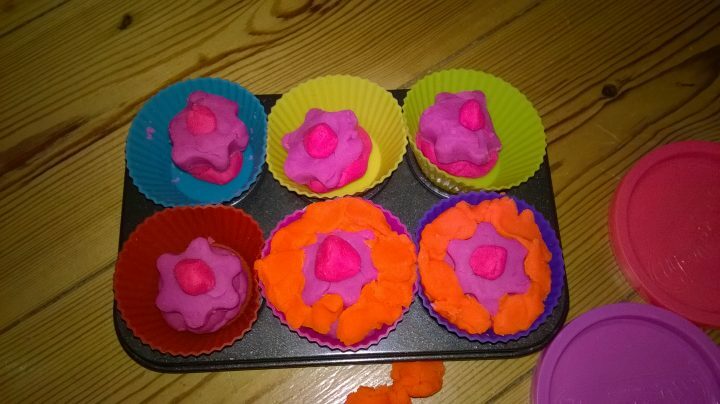 Liquid and gel food dyes do not work when colouring moon dough – it needs to be a dry powder. 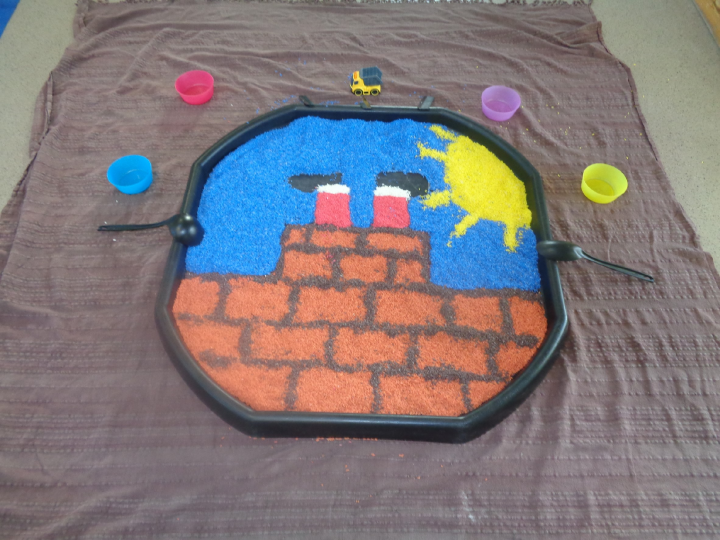 I have grated chalk in before and this also works, but is not as vibrant as powder paints. A moon dough Swirlo from my Ringmer class. Method: Put the flour in a large bowl (I use a washing up bowl). Add one cup of oil a little at a time. Rub into the flour with your hands. When the dough starts to stick together but crumbles when you squeeze it, you have the correct consistency. Add powder paint a little at a time until you have your desired shade. PLAY!! 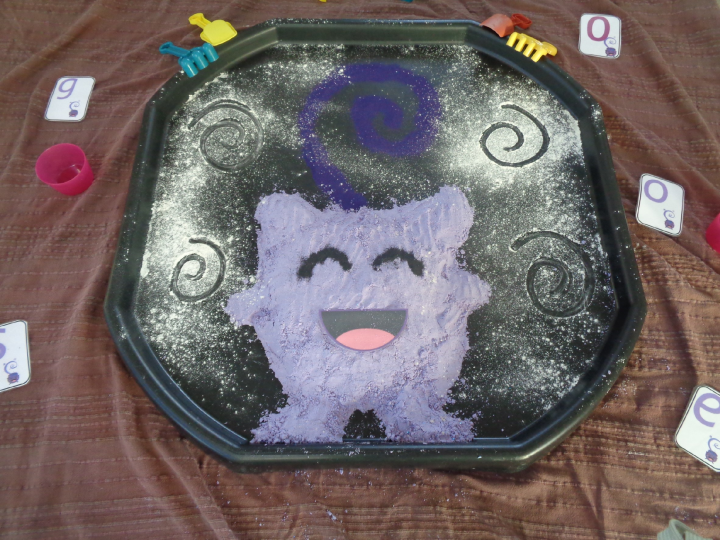 You can use sand toys with moon dough. I also love to hide things (such as small animals/dinosaurs) in the moon dough for children to search for. 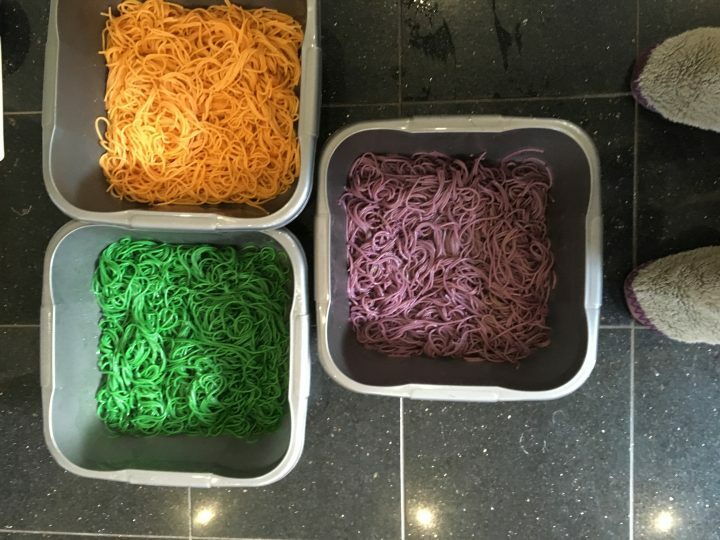 This is a really easy way to colour dried rice and pasta and it looks so inviting to play with! 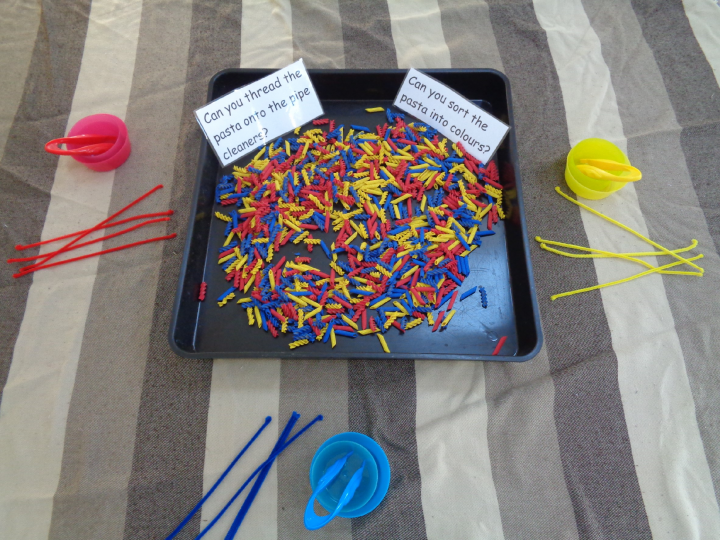 A great fine motor activity, threading pasta onto pipe cleaners. Just look at those colours! 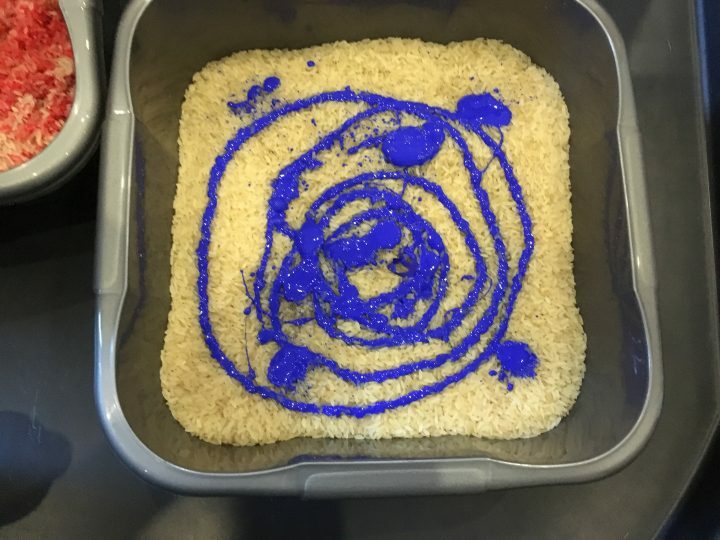 Coloured rice can be made to make all sorts of pictures or you can just mix it all up together and have rainbow rice ! My big learners helping make the coloured rice. Method: Simply fill a bowl with dry white rice or pasta of your choice. Pour in ready mix paint a little at a time and mix thoroughly. Spread out and leave to dry. It is surprisingly quick to dry! PLAY!! This is a little messier than the three ideas above but so much fun! Gloop is simply made out of cornflour and water. It has the best feel to it – I can never drag myself away when I have it in class! It is both solid and liquid. Here’s the scientific bit! 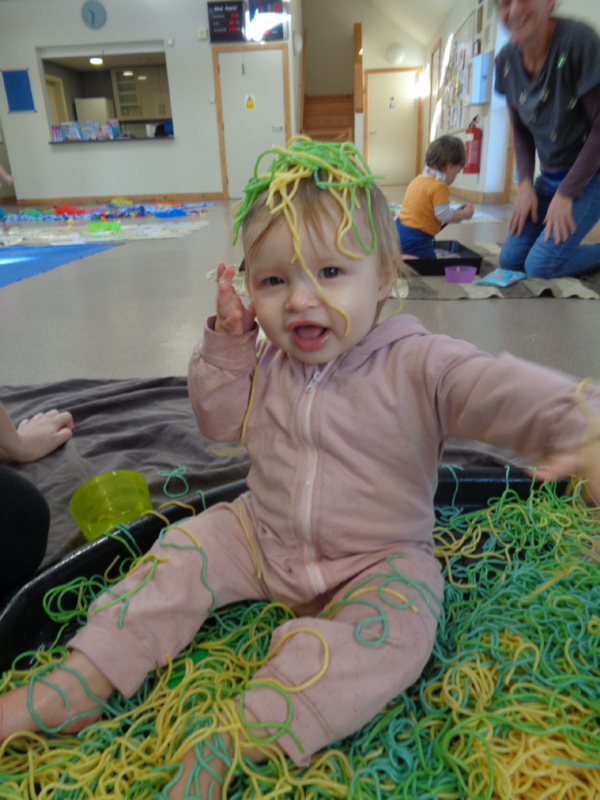 Cornflour is made of lots of long, stringy particles. When water is added they do not dissolve in water, but they do spread themselves out. This allows the gloop to act both like a solid and a liquid. When you roll the mixture in your hands or apply pressure to it, the particles join together and the mixture feels solid. But if it is left to rest or is held up and allowed to dribble, the particles slide over each other and it feels like a liquid. Method: Put the cornflour in a large container. Drop a few drops of food colouring in the middle of the flour if using. Gradually add the water whilst mixing. It will take a while to mix together fully. It should feel like the consistency of milk. If left a while, it will begin to solidify at the bottom and you will be able to pull the solid out and it will turn to liquid! Amazing!! I do find that food colouring can stain hands a little (but it will come off in the bath!) so I usually opt for a little poster paint if I want to colour it. This option does mean it is less edible though so entirely your choice! This can be done with any kind of pasta you like, but my favourite is definitely spaghetti! This is great for little ones to play with because it is entirely edible so you don’t need to worry about them putting it in their mouths. Spaghetti rainbow from my park event. Zig zag pasta for Ziggy week. Method: This one is so easy. All you need to do is add food colouring to the water and cook the pasta as normal. I would cook it a little less than normal so that it doesn’t get stuck together. Spread out and leave to cool. Once cooled, you can add a little oil to create a slimy texture. Top Tip! You can put your cooked pasta in a carrier bag or food bag and freeze. This means you can make a large amount and just get a batch out when you want to play with it. 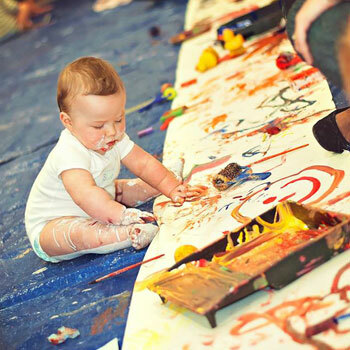 So – those are my top 5 Messy Play activities that are easy to make and do at home. 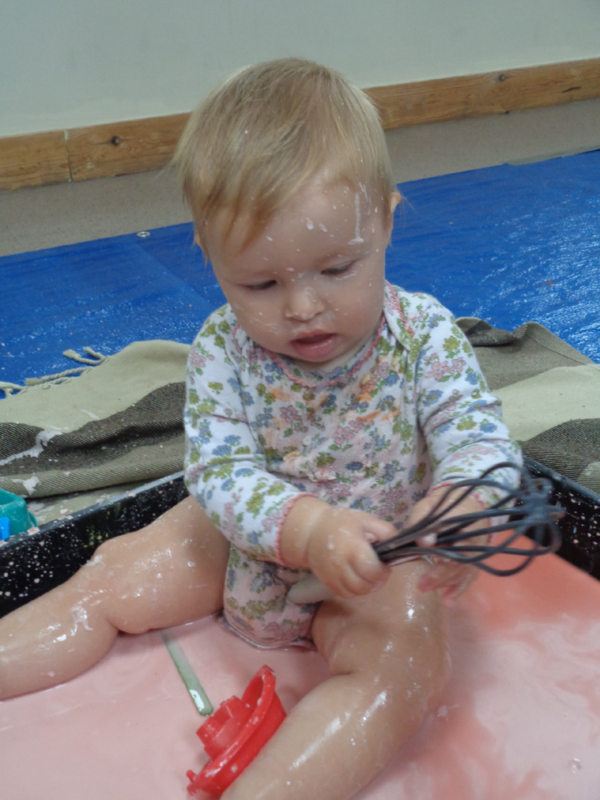 Get the children involved in the making stage too – they love to mix the ingredients and feel the changes in textures. Which one will you try first?! 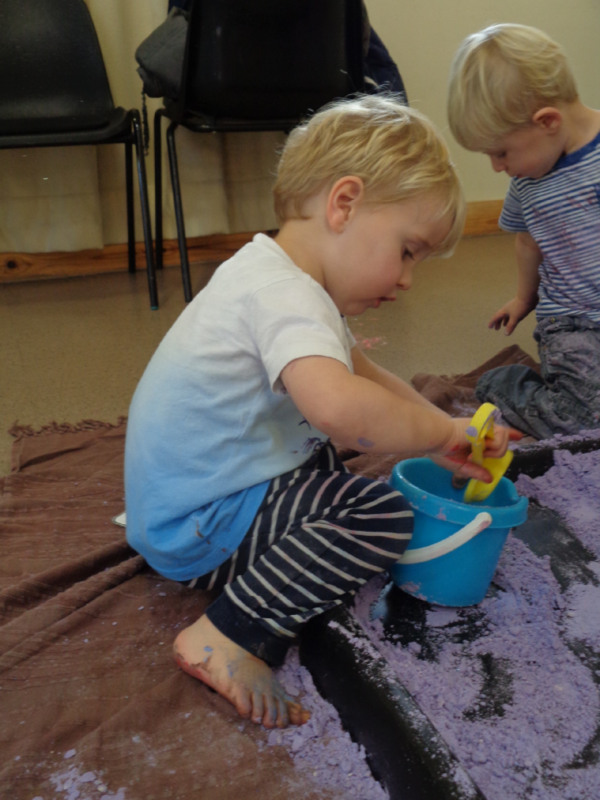 If you want to see some different messy play activities at the same time as learning pre-writing skills, why not come along to one of my classes in Brighton, Cooksbridge, Ringmer or Uckfield? « Previous Bath time fun!